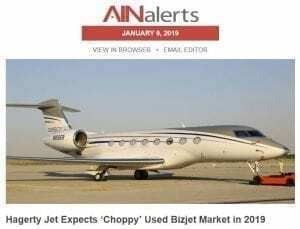 Hagerty Jet Group, which specializes in Gulfstream transactions, expects a “choppy” preowned business jet market this year due to political uncertainty and equity market volatility. “Demand for aircraft less than five years old will remain strong, but older aircraft will continue to decline in value, although at a slower pace than in 2017,” it predicted in a market report released yesterday. While would-be buyers were frustrated with the lack of preowned business jet inventory in the fourth quarter, volatility in U.S. equity markets last month made some buyers reluctant to pull the trigger on an aircraft purchase, according to Hagerty Jet. If that trend continues into 2019, this could mean less competition for aircraft already on the market and thus potential for inventories to grow again, it noted. The firm expects the tight supply of younger Gulfstreams to ease, as new G500s enter service and the upgrade cycle introduces preowned, six- to 10-year-old G450 and G550 inventory. “This new supply will help, but not entirely satisfy strong demand for preowned aircraft less than five years old,” Hagerty Jet added. Meanwhile, it said the preowned G280 market is healthy, with resale values remaining relatively strong for the super-midsize jet. And inventory for ultra-long-range Gulfstreams is very low, with just 3.2 percent of the 342 in-service G650/650ERs up for sale, according to Hagerty Jet’s data.